This is my F5 testimonial. The story goes like this. I have worked with and owned Servals in the past. I can attest they are the most amazing creatures. Their friendship and intelligence shows no bounds. They are smarter than some people I deal with lol. Their bond is that of a son or daughter. With that said time has passed and I heard so much about the Savannah cat. So I did my research. And it lead me to A1 Savannahs. Of course immediately I wanted an F1 but financially that was not an option. After speaking with Amanda I felt for my â€œfirstâ€� Savannah Iâ€™d go with an F5 male. 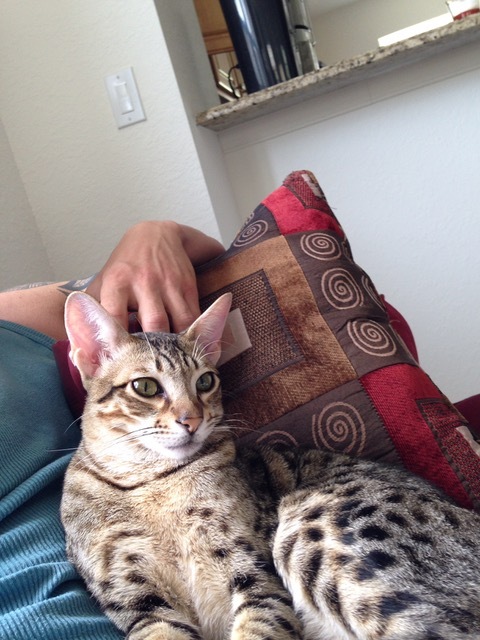 Now my expectations are obviously high due to owning Servals and this cat was actually part Serval. He arrived! I was amazed from the moment I opened the crate at the airport. He jumped out and it was like a hug! I still was a little skeptical ðŸ¤¨ lol Iâ€™m like this might be too good to be true. We get home. I immediately let him get acclimated to his new surroundings. But he didnâ€™t care he wanted to play. He did in fact play fetch. He chased the toy down and brought it right back, I was like no way! Yes! Serval blood is running though his veins. Hours of fetching, it was real , I was shocked. Then he began to follow me everywhere, jumping on my shoulder or just sitting on my lap. Obviously we bonded. These were all the things my servals would do. My gf now Wife comes over the next day. â€œNo wayâ€�, was her first comment. How did you train him to do all this in one day. I laughed and said I did nothing. Through the last 3 years he became a loving member of our family. He waits at the door, he knows the engine sound of our cars. Nothing has changed from day one except him becoming something I never could have imagined, a friend and a son. Our goal next is an F3. Trust A1! A true cut above the rest.